FilmOn, the video download service, is offering its customers a speedier service this week, with the launch of its new technology HDi. According the founder of FilmOn.com, Alki David (the 47th richest man in the UK no less), the new technology is like a turbo-charge for the streaming website, and will transform the broadcasting industry. The advent of HDi means that FilmOn users can appreciate live TV programming and VoD content without any buffering times. 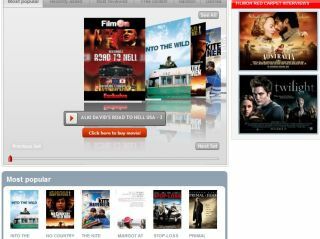 Launched in May of this year, FilmOn so far has a collection of 7,000 films, with around 70 per cent of them available for free. Speaking about the new speedy technology, David said to the Times: "The way we watch film is changing. People used to dress up to go out to the cinema. Then it was a trip to the video store. Now you're at home with your plasma TV and an internet connection. "We're trained to watch what's on the box, but audiences are not fools and it doesn't take long at all to change. The YouTube generation is a good example. You can seek what you want to watch when you want. We're the next step. It's a natural evolution to qualitative distribution." The new compression software used by FilmOn was created by Rich Crosby, Digital Utilities's chief scientist, and has been 15 years in the making. Speaking to the BBC about the new technology, he said: "The FilmOn Network Operation Centre makes use of the same grid and cloud technology used by CERN and government agencies. "The processing power is spread out across the globe, rather than on a single server. We start off with a few servers in select places and as demand picks up, a fresh cluster kicks in. "What makes us different from a traditional grid is that the CPU's actually talk to each other across the global network. So it knows where the loads are and where projected loads will occur." With the advent of HDi, FilmOn plans to widen its reach with a 3G streaming version of the site for mobile phones in the works and a set-top box soon to be unveiled.